Cookin' with Cheri – Page 3 – Cheri Henderson shares how to create great meals with the Bread of Life in mind! I look forward to sharing it with you, Dad. but have gone on to another place. until we’re with them once again. as we sing to the One standing before us . . .
forever . . . truly “home” for the holidays. Juicy and sweet and renowned for its concentration of vitamin C, oranges make the perfect snack and add a special tang to many recipes; it is no wonder they are one of the most popular fruits in the world. The benefits of this wonderful fruit include antioxidant protection and immune support, protection against cardiovascular disease and cholesterol-lowering benefits! Granted, when they become part of a dessert, some of these benefits may be diminished, but sometimes the sweet treat is worth the trade-off, don’t you think? Alone as created, oranges are great! But mix them up with other ingredients, and you can have a delicious and appealing dessert! Soften cream cheese at room temperature starting a couple hours before making your pies; the cream cheese must be super soft in order to avoid lumps in the pie filling. Blend cream cheese and frozen whipped topping well; add orange juice and beat with mixer until very creamy; stir in pudding then gelatin and blend well. Divide filling between graham crusts; chill at least 3 hours before serving. Decorate with whipped cream and thinly sliced oranges if desired. In this case, the orange was joined with other ingredients to make a delicious dessert, but the trade-off was the nutritious benefit from the orange alone. Sometimes our desire to align with other people or other things in an effort to gain popularity or recognition is not in our best interest and may even injure those around us. A Parable: A lone orange tree, in the midst of a vast apple grove, was so impressed by the beauty and popularity of his surrounding neighbors; he yearned to be just like them. With great unhappiness, he looked upon his dimpled, tough exterior and then gazed longingly at the apples’ smooth, shiny red skins. “Surely”, he thought, “they are more palatable and easier to eat than my fruit which has to first be peeled before anyone can even bite into it!” So in an effort to become like them, when the wind would blow, he’d lean his limbs towards the branches of the nearby apple trees, rubbing up against them, hoping a transfer would take place that could change him … but nothing happened. So he pressed his roots further and further out towards the roots of his neighbors, thinking if he could intertwine with theirs, perhaps that would be the thing that would change him … but an orange tree he remained. 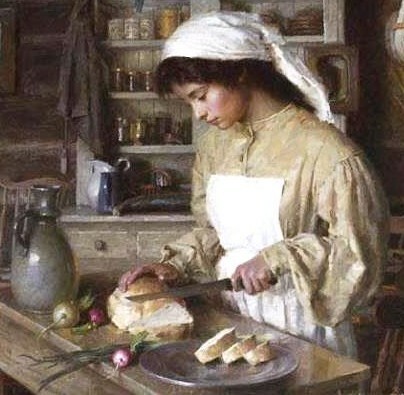 The Parable of the Story: Dissatisfaction with our God-given gifts, an unhealthy envy and misplaced longing (encourage by the good intentions of unwise “helpers”), can destroy God’s true plan and purpose for our existence, leaving destiny unfulfilled and lives impaired by the lack of spiritual “nourishment” we could have provided. “Orange” you glad you’re a follower of Jesus Christ, perfectly created to bring Him glory? Created in His image, He thinks you’re beautiful! Who are we to disagree? 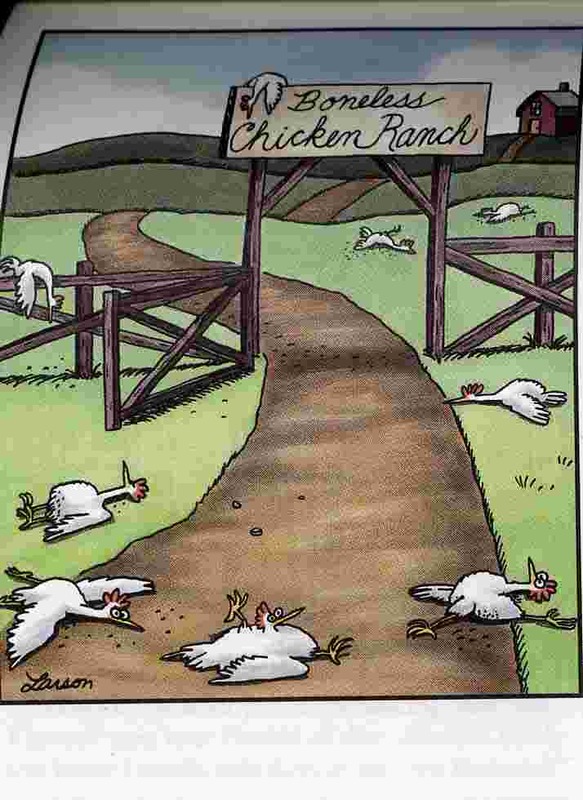 As I was preparing this recipe last night, I began to laugh as I remembered Gary Larson’s “Far Side” illustration of the “Boneless Chicken Ranch”. 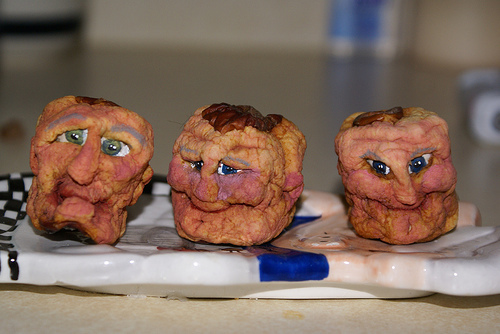 When it first appeared in the newspaper back in the 1980’s, my husband and I thought it was so funny, we displayed it on our refrigerator for months! Those poor chickens! What a terrible way to live! But when it comes to making a recipe, I’m very thankful for the availability of boneless chicken breasts! I realize they are a little more pricey than buying bone-in chicken, but I find the ease and time saved from not having to remove the bones is worth it! Set oven to 400 degrees. Spray a 9×13 pan with cooking spray. Crush crackers in a gallon-sized zip lock bag. If using chicken breasts and not tenders, cut each chicken breast into 3 large pieces. Pour the milk into a small bowl and in another bowl, stir together the salt and paper, cheese and crackers. Dip each piece of chicken into the milk and then the cracker/cheese mixture. Generously press and mold the cracker mixture around the chicken with your fingers and lay the chicken inside the pan. Once all of the chicken is in the pan, cover with any remaining cracker mixture and sprinkle the dried parsley over the chicken. Cover the pan with tin foil and bake at 400 degrees for 35 minutes. Remove the tin foil, bake for an additional 10-15 minutes, or until the edges of the chicken are golden brown and crispy. Delicious! And wonderful served with mashed taters and a vegetable or side salad! When Christians lack the power to stand, I wonder if the enemy views us in a similar way to the boneless chicken ranch . . . as “spineless little chickens”, prime for his recipe of destruction? In that scenario, what an easy target we would be for a good kick in the head . . . or perhaps a 40-yard punt into a territory we were trying to avoid! When faced with a situation where we’re feeling a little “weak in the knees”, what is our best recourse? How do we remain standing? The best way to remain standing is to first kneel. 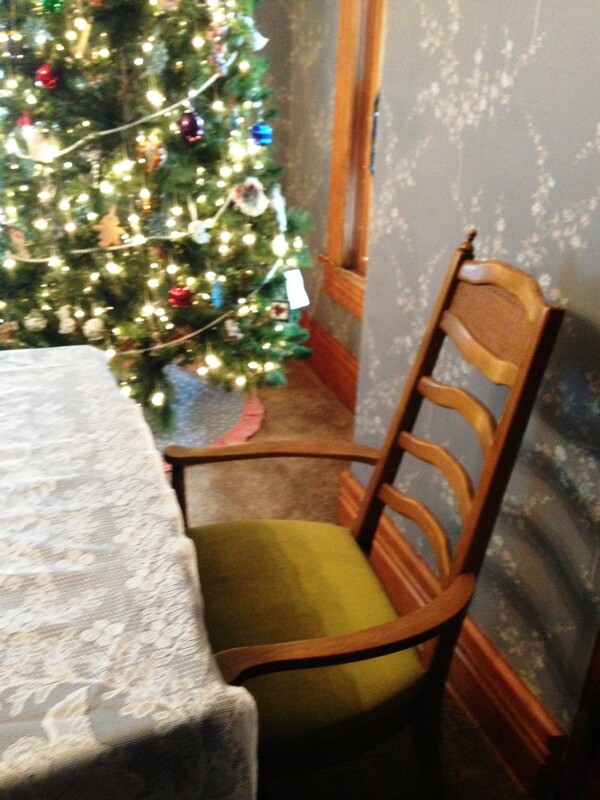 I love the traditions of the holidays, especially those surrounding our family meals. One, in particular, is Mom’s Pumpkin Apple pie. It matters not whether it’s Easter, Thanksgiving or Christmas (and although Mom has pretty much handed off the responsibility of creating it to one of the daughters or daughter-in-laws), it is still a “must have” at our family holiday dessert table. Place pie shell in a 10” pie pan. Pour apple pie filling into shell. In a large bowl, combine cornstarch, spices, salt and sugar. Add pumpkin, molasses, and melted butter. Blend well. In another bowl, combine milk and eggs. Stir into pumpkin mixture. Pour over apple pie filling. Cover crust edges with aluminum foil or a pie crust shield and bake at 425 degrees for 15 minutes. Turn oven down to 350 degrees and continue to bake for 45 – 60 minutes. (Insert a knife in the center and if it comes out clean, it’s done.) Cool. Top with whipped cream. This particular dessert has always seemed to be such an appropriate creation for my Mom because my Dad’s pet name for my mother was “punkin”. I remember Dad using that term of endearment for Mom many times during my childhood, and whenever he used it, it was delivered with a gentle, loving fondness for her. Bogged Down and Sour No More! Cranberries by themselves can be a pretty sour eating experience! But when combined with other complimentary foods, spices, or sugars, they contribute towards a unique blend of flavors . . . and a nutritious, finished entrée! Preheat oven to 350 degrees. Prepare a glass baking dish by spraying with cooking spray. 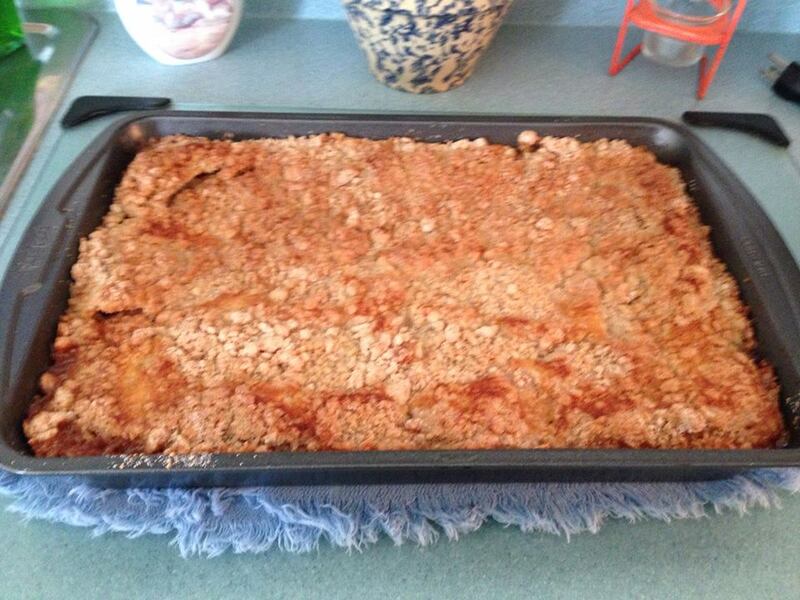 Place chicken breasts into baking dish and sprinkle with cheese. Stir together chicken soup and wine; pour over chicken. Sprinkle chicken with stuffing mix and cranberries, drizzle butter over top. According to “How Stuff Works.com”, cranberries are a very sought-after crop because they’re versatile and packed with nutrients and antioxidants. They also grow in a most unique environment – a bog … which is a wetland full of sphagnum moss, acidic waters, and peat deposits. While growing in a bog, cranberry plants have to contend with a host of unfavorable conditions, and it’s amazing they have the durability to survive in this habitat. Cranberries need fresh water to survive, but bogs consist of mostly acidic water. God has designed this plant, however, with tough woody stems and small leaves that have a leather-like consistency. This design enables the plant to retain as much fresh water as possible by restricting the amount of usable water that passes through. The plant’s fine roots also absorb and use organic nitrogen to survive, despite the scarcity of nutrients in the bog’s sterile soil. What’s more, cranberry vines are resilient — an undamaged one can last indefinitely. In fact, some vines have been found to be more than 150 years old! Considering the cranberry’s delicate nature and vibrant ruby red glow, it’s hard to imagine that the ideal environment for its survival would be such an unusual and harsh place. But God created it to survive and thrive . . . just as He has each of us. When we gave our hearts and lives to Jesus Christ, we became new creations that day, old things passed away, all things became new … and the presence and power of the Holy Spirit in our lives from that point forward has given us the “durability to survive in this habitat”! “The Spirit also helps us in our weakness; for we do not know how to pray as we should, but the Spirit Himself intercedes for us with groanings too deep for words.” – Romans 8:26. We live in an unusual and harsh place, but we are not part of it! “Dearly beloved, I beseech you as strangers and pilgrims, abstain from fleshly lusts, which war against the soul;” – 1 Peter 2:11. “The thief comes only to steal and kill and destroy; I have come that they may have life, and have it to the full.” – John 10:10. “Bogs filled with acidic water” may surround us, but John 7:38 tells us “He who believes in Me, from his innermost being will flow rivers of living water.” And just as the cranberry plant’s fine roots absorb organic nitrogen to survive … if it were left up to the nutrients of this world, we would spiritually starve to death! Jesus is, however, the vine from which we draw our nutrients! “I am the vine; you are the branches. If you remain in me and I in you, you will bear much fruit; apart from me you can do nothing.” – John 15:5. And just as the cranberry vines are resilient and can last indefinitely, we too will live forever! “For God so loved the world that he gave his one and only Son, that whoever believes in him shall not perish but have eternal life.” – John 3:16. Lastly, just like cranberries by themselves can be a sour eating experience, Christians facing tough times alone may find their walks weakened and their dispositions soured. That’s one reason why God places the children He has adopted into spiritual families, the faith communities where we both give and receive encouragement. “Let us hold unswervingly to the hope we profess, for he who promised is faithful. And let us consider how we may spur one another on toward love and good deeds, not giving up meeting together, as some are in the habit of doing, but encouraging one another—and all the more as you see the Day approaching.” – Hebrews 10:23-25. Those of us who follow in the steps of Jesus are called to fellowship with each other, to encourage and build one another up. And as we do, the unique gifts He’s given to each of us will blend together to deliver a spiritually nourished church full of love and good deeds! What Color are Your Leaves? Soon the crisp coolness of autumn will be nipping at the air, and nothing inspires me to spend more time in the kitchen than when the temperatures start to drop a bit! The warmth of the oven, the hearty aromas of simmering soups, chowders and stews, baking breads and sweet desserts are so welcoming when it’s chilly outside! So in celebration of the soon-arriving fall season, I think some colorful sugar cookies would be the perfect way to welcome it in! Any leaf-type cookie cutters are great for this project, but if you have a maple leaf design, that’s even better! So grab your cookie cutter (or if you’re in need of one, take a look at http://www.cookiecuttersonline.com/?maple_leaf_cookie_cutter), and let’s get busy! In a bowl, cream butter and sugar until light and fluffy. Add eggs and vanilla; mix well. Combine flour, cream of tartar, baking soda and salt; add to creamed mixture and mix well. Roll out on a floured surface to 1/8-in. thickness; cut with a cookie cutter dipped in flour. Place them 1 inch apart on ungreased baking sheets. 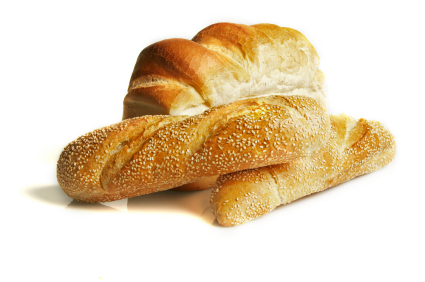 Bake at 350° for 8-10 minutes or until edges are lightly browned (do not over bake). Remove to wire racks to cool. For frosting, beat confectioners’ sugar, butter, vanilla and salt. Add syrup; beat until smooth. Divide the icing up into 3 bowls, and if leaf veins are desired, set aside an additional 1/2 cup; stir in a drop or two of red, orange, and yellow food coloring (and green if creating veins) to each frosting bowl. Add more food coloring, if desired, to darken it to the shade you want. Spread the frosting on the cookies. Cut a small hole in the corner of a plastic bag and insert round tip into bag. Fill bag with the brown frosting and pipe veins onto the leaves. Yield: about 6 dozen. Every autumn, I am always awestruck by the beauty of God’s creation. As the green leaves transition to a spectacular blend of fiery yellows, oranges, and reds, they are such a breathtaking demonstration that there is NO artist like our Father! What the painter’s brush can only imitate, He has created! I did a little research about this God-orchestrated activity . . . and did you know that seasonal conditions (such as a lot of rain or too little rain) are the key factors in the timing and coloration of the leaves? When we experience a summer drought, the fall colors are more muted and less colorful. However, a summer with an abundance of rain, followed by clear, sunny days and cool nights in late September-early October bring about the most striking autumn colors. Similarly, as Christians, there are certain conditions that can cause spiritual changes in our lives, aren’t there? In the spiritual sense, when we position ourselves in a drought-like situation . . . with little or no prayer or intimacy with the Lord . . . little or no reading of His Word . . . when we quench the presence and power of the Holy Spirit in our lives . . . we, too, will lack His beauty, His brilliance, and His strength. Send your rain, Lord! As the temperatures cool and the days shorten, cells at the base of the leaves disintegrate, blocking passages from the leaves to the branches and causing the chlorophyll to decompose. Chlorophyll is what gives most plants their green color. As the chlorophyll dies away, the yellow pigments (carotenoids) and red pigments (anthocyanins), come to the surface. And so it is when we die to self . . . when we block fleshly desires from ruling our bodies and allow the Holy Spirit to take control, His character permeates us . . . and the beauty of Christ comes to the surface. Trees with leaves having a lot of carotenoids (like beech, birch and willow), turn varying shades of yellow. When anthocyanins predominate (as in the case of many maples, dogwoods and sumac), the reds appear. Variations in color from tree to tree, or even from branch to branch, are often caused by stress factors like disease, injury, or unusually wet or dry conditions. These factors contribute to the timing and degree of brilliance of the changing colors. As followers of Christ, when we fully yield to the Holy Spirit and allow Him to mold us (painful though sometimes that may be), our transformation will be complete. And just as the Master Artist ordained it, our individual gifts will complement the needs of the Body and we will radiate the brilliance of Jesus Christ! There are beautiful variations from Christian to Christian and even church house to church house – and all were created by the Master Artist to complement each other, so that when we are united in harmony, we are a breathtaking picture to the world! Bleu, Bleu . . . Anybody remember the 1960’s tune, “Love is Blue”? “Blue, blue, my world is blue. Blue is my world when I’m without you.” Well today I’m re-writing the lyrics a bit! Everyone sing along! Bleu, bleu, my meal is bleu. Bleu is the meal I’m about to serve you! Bleu cheese is one of those unusual foods that people either really enjoy or totally dislike: a cheese that is spotted or veined throughout with blue, blue-gray, or blue-green mold and has a very distinctive odor. Understandably, some people can’t get past the appearance or smell . . . but, if you’re able to do so . . . or if you’re already a bleu cheese aficionado, you’re gonna love this meal! Chop the lettuce and remove stems from the spinach leaves and then toss the two together. Cut the red & yellow bell peppers, zucchini, yellow squash and carrots into ¼ inch wide and 2” long strips. Combine all and place in a large frying pan with the olive oil. Add the crushed clove of garlic, chopped red onion, salt and pepper and then sauté for 15-20 minutes or until tender. While the vegetables are cooking, make 3 ground sirloin patties and grill or fry until done according to your taste. Divide and spread the lettuce & spinach mixture onto 3 plates. Top with the sautéed vegetables. Apply a circle of avocado slices and halved cherry tomatoes and place the grilled burger right in the center. Drizzle with bleu cheese dressing and enjoy! In Habakkuk 3:17-19, it says: “Even though the fig trees have no blossoms, and there are no grapes on the vine; even though the olive crop fails, and the fields lie empty and barren; even though the flocks die in the fields, yet I will rejoice in the Lord! I will be joyful in the God of my salvation. The Sovereign Lord is my strength! He will make me as surefooted as a deer and bring me safely over the mountains.” Habakkuk’s vision ended with a beautiful word picture: No matter what happens, I will find joy in the Lord and he will make me as surefooted as a deer. Habakkuk does not say that the Lord will make his way easy, but, rather, that the Lord will sustain him along his path. Blue, blue, I will not be blue. Jesus Christ is with me and He will see me through! When the reality of eternity is mine . . .
and there’s great peace in the knowledge of that. 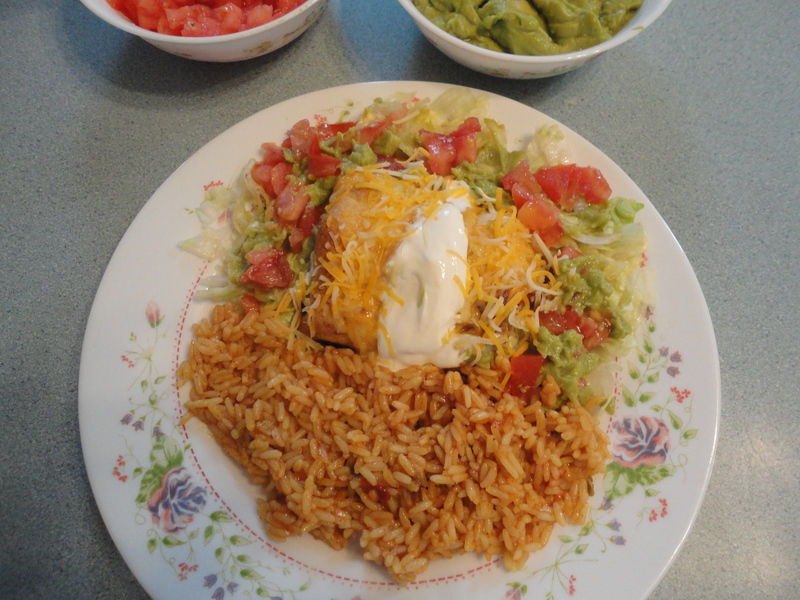 Un Gran Relleno – Chicken Chimichangas! Who loves Mexican food? I do! I do! And for Mexican food lovers, the Chimichanga is a definite favorite! For those of you who haven’t yet had the pleasure, Chimichanga is a flour tortilla, filled with a wonderful ingredient like chicken, or steak, or seafood, and is usually accompanied by great side items like salsa, sour cream, cheese, guacamole, and Mexican rice! And the wonderful thing about the following recipe is you can prepare the chicken and the sauce a day or two ahead and refrigerate it if you’d like! A real time-saver for the evening when you actually make the Chimichangas! Place the chicken in a slow cooker. Sprinkle the taco seasoning over the meat then layer the vegetables and salsa on top. Pour a half cup of water over the mixture, set on low and cook for 6-8 hours. The meat is cooked when it shreds or reaches an internal temperature of 165°F. When ready to serve, break up the chicken with a fork then stir in the sour cream. Saute chopped onion and chopped garlic cloves in a skillet with vegetable oil. Add chili powder, cumin, sugar and salt; cook 30 seconds. Stir in chopped green chiles; cook 2 minutes. Add chicken broth and simmer until thickened, then puree. Stir in chopped cilantro. Preheat the oven to 450 degrees. Melt the butter and vegetable oil in a small pan. Brush a rimmed baking sheet with some of the butter-oil mixture. Spread 2 tablespoons refried beans down the center of each tortilla, leaving a 2-inch border on both ends. 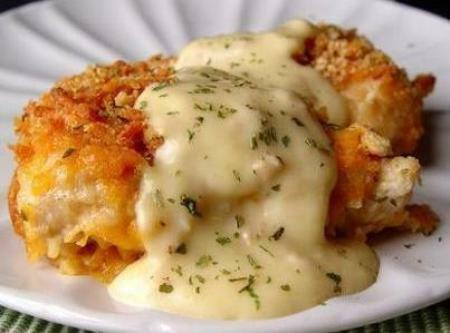 Top with 1 cup chicken mixture and 1/4 cup cheese. Fold in the ends and roll up. Remove from oven. Place each chimichanga on a plate and top with warmed Chimichanga Sauce, more cheese, and sour cream. Surround with chopped lettuce, guacamole, and diced tomato. Serve with Mexican rice. Muy bueno! In the same way that these flour tortillas are filled with a wonderful ingredient, so are you as a follower of Jesus Christ! The Spirit of God dwells in you! Each of us possesses the Holy Spirit from the time we repent and believe. “You are not in the flesh but in the Spirit, if indeed the Spirit of God dwells in you. And if Christ is in you, though the body is dead because of sin, yet the spirit is alive because of righteousness.” (Romans. 8:9-10). Paul goes on to say in Ephesians 5:18, “Be filled with the Spirit.” The Greek word for “be filled”, plerousthe, literally translates “keep being filled.” When the greatest evangelist of the nineteenth century, D.L. Moody, was asked why he said he needed to be filled continually with the Holy Spirit, he replied, “Because I leak!” Like Moody, we all run out of gas and need the power of the Holy Spirit to recharge our lives. To be filled with the Spirit means we are continually seeking, submitting to and experiencing the Holy Spirit’s guidance and control in our lives. Unlike the filling in a Chimichanga – once it’s depleted, it’s gone, but we can continually be refilled as we yield moment by moment to the leading of the Spirit. And as we surrender to the control of God’s Spirit, we’ll find Him producing some amazing things in us! The filling of the Holy Spirit is accompanied by some great “side items” that Paul calls the fruit of the Spirit. They are: “love, joy, peace, patience, kindness, goodness, faithfulness, gentleness, self-control.” (Galatians 5:22-23)! So . . . ser llenos del Espíritu Santo. ¡Es muy bueno!